The eRecord has three copies of Freedom to give away. Simply email editor@therecord.com.au with your name, phone number and address. Winners will be notified by phone on Friday, 14 August. All entrants must be over 18. Starring Cuba Gooding Jr, William Sadler, Sharon Leal, David Rasche, Terrance Mann, Jubilant Sykes, Tony Sheldon. Directed by Peter Cousens. Rated M (Mature themes and violence). 98 minutes. Freedom is a bold name and title for a film. The freedom, and the desire for freedom, portrayed here is that of the African-American slaves of the 19th century, the hardships of the transportation from Africa, the sales, the plantations and their owners, often violent and vicious, and the possibilities of escape through the Underground Railroad. This is a very worthy film, a strong message about freedom, linked with the religious conversion of John Newton, author of Amazing Grace. While many audiences appreciate this kind of film, critics tend to be very cautious, not wanting to be identified with a religious-themed film, expressing over-sensitive remarks about the social and religious messages. 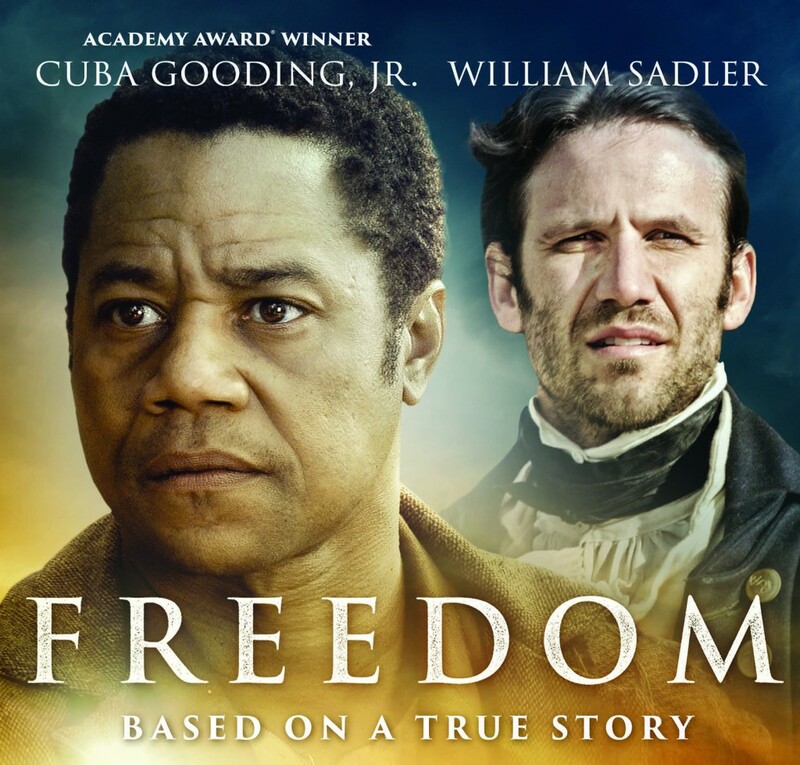 Be that as it may, many audiences would be very interested in the two stories in Freedom, that of the slaves in the 19th century and the story of John Newton in the 18th century. The two plot lines are intercut throughout the film, but brought together at the end where the main slave taking his family to freedom is the great grandson of a boy slave to whom John Newton gave his Bible. Cuba Gooding Jr has a substantial role (different from the many straight-to-DVD action films in which he has appeared for so many years). He is also one of the executive producers of this film. He plays Samuel, who organises plans for his family’s escape, for his elderly mother, his wife (who is actually the daughter of the vicious plantation owner, mixed-race) and his son. And the film shows in some detail the various steps for escape via the Underground Railroad, the places travelled to, the time taken, the wide range of dangers and difficulties, even to the Canadian border and freedom, and the reality of legislation against anyone helping slaves escape, the setting being the 1850s, not too long before Lincoln’s abolition of slavery. The slaves on the plantation are assisted by a Quaker, Mr Garrett, who helped slaves over many decades, to a refuge beyond the plantation, travel by cart and horse, risking road barriers with plantation hands and guns, to a Quaker house and hiding, to escape on horseback, to hiding on a train in cotton bales, assisted by slaves, to the Mason-Dixon line, where they are taken in by a theatrical troupe and helped across the line to meet the famous abolitionist, Frederick Douglass. Life on the plantation is presented vividly, especially in the anger of the owner and his whipping of one of the slaves who risked his life to let the others go and was caught. Audiences will be moved by watching the experience as well as being informed on the realities of the Railroad. And, intercut with this story is that from 100 years earlier, the story of John Newton. Newton had been in the Navy, had been flogged, had found himself put in charge of a slave ship – accepting the reality of the slave trade as part of Britain’s life. He is engaged to be married and his fiancée gives him a Bible with an inscription about freedom. We see Newton in Gambia, at the slave market, the branding of the slaves, their being put on the ships in cramped conditions, which leads to a number of deaths and illness. There is an educated slave, Isaiah, who has an influence on Newton and who consoles the young boy whose family had died – the great-grandfather of Samuel, escaping 100 years later. Moved by the slaves, tormented by dreams and buffeted by a vast storm, Newton has something of a conversion experience and, on his return, after the wedding ceremony, he sings Amazing Grace – as do the descendants of the slaves in the 19th century. The story of Newton and his influence on William Wilberforce was seen in the film Amazing Grace, a film to be recommended. Another film on Britain and slavery, social and political attitudes, which is worth seeing is Belle.